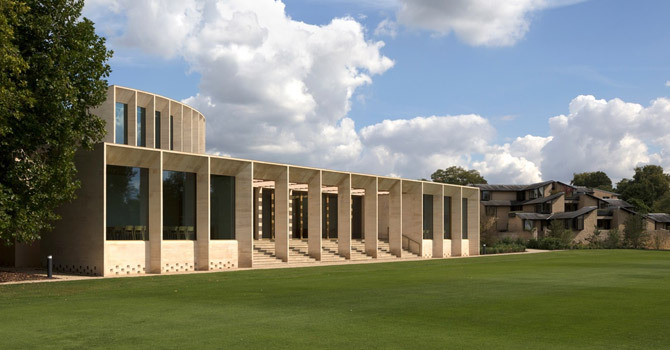 Nazrin Shah Centre at Worcester College. The stunning building is short listed for the UK’s best new building at the 2018 Royal Institute of British Architects Stirling Prize for its eye-catching design. Our team of experts carried out all the groundworks, reinforcement and concrete works for the building structure and drainage. The detailed project was completed on time and on budget. The Sultan Nazrin Shah Centre is a single story, 120-seat building containing a lecture theatre, a dance studio and seminar rooms designed by Níall McLaughlin Architects. The centre is named after Nazrin Shah, an alumnus of Worcester College and the eldest son of the Sultan of Perak in Malaysia.